In 1827, Thomas Barnett built the first building 300 feet south of the Table Rock and established the Table Rock Museum. Barnett built a stairway to the base of the gorge and the foot of the Horseshoe Falls. 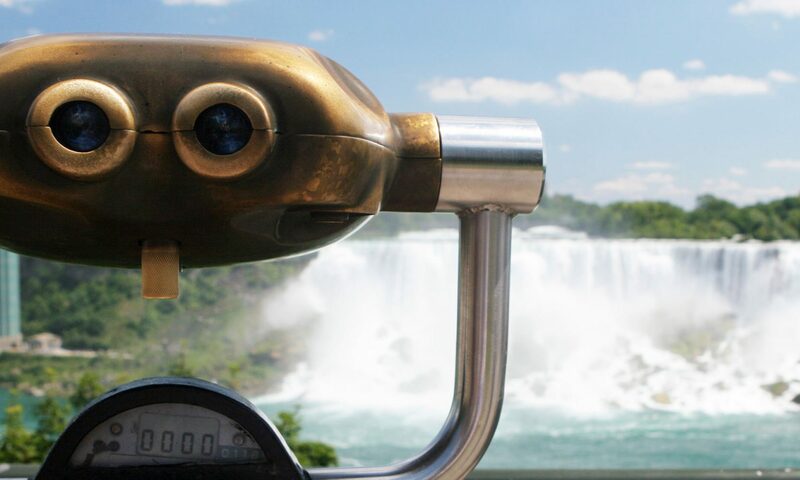 Barnett offered tourists a tour “Behind the Sheet” which included a walking tour to the base of the Horseshoe Falls and along a short ledge behind the falling water. In 1852, William Hamilton Merritt, president of the St. Catharines, Thorold & Niagara Falls Toll Road Company sought permission to build a toll road from Ferry Road (currently Clifton Hill) to the Table Rock. The only problem for Merritt was that a road had already been partially established by the Suspension Bridge Company. This road was named Front Street. The portion of Front Street from Murray Hill ravine to the Table Rock became known as “the Front”. In 1853, Saul Davis built a hotel immediately south of Barnett’s Table Rock Museum. Davis named his hotel, the Table Rock House. The Front became a tourist trap of seedy curiosity shops, souvenirs, hotels and museums. Saul Davis’ Table Rock House became known as the “Den of the Forty Thieves”, because of the thieves, scam artists and prostitutes. In 1859, Thomas Barnett erected a new building to house his museum at the foot of Murray Hill ravine. In 1860, Saul Davis had been granted a lease to build a staircase and to allow tourists to tour “Behind the Sheet”, Thomas Barnett’s attraction. A joint lease between the two was conditional, providing that Saul Davis allow free access to the Falls. Also he was to charge persons using his new staircase no more than 25¢. In 1861, Davis built a stone wall with a gate at the north end of his property. Davis closed and locked this gate which resulted in Barnett’s customers from being allowed access to the Behind the Sheet as agreed to in the joint lease. In 1862, the joint lease was canceled. On April 23rd 1865, Davis’ staircase to the base of the gorge was burned to the ground. On December 19th 1865, a restraining order was issued against Saul Davis preventing he or any of his supporters from hindering and interfering with Barnett and access into the gorge for his customers. In 1866, Saul Davis obtained another lease to build and operate a new staircase. Davis sold his lease to Rolland MacDonald. In 1869, Thomas Barnett obtained a Crown lease which gave him full access of the talus slope from his museum to the base of the Horseshoe Falls. Saul Davis erected a new stairway and began taking tourists “Behind the Sheet”. During the Barnett – Davis feud, three staircases leading to the gorge had been destroyed. In 1877, Thomas Barnett went bankrupt. His museums and other buildings were sold for debt relief to Saul Davis. Davis had sole control over the Front and continued to operate for another ten years before the establishment of the Niagara Falls – Queen Victoria Park.